I recently attended Neocon, North America’s premier trade show and conference on commercial interiors, products and evolving design trends. This conference, which is held at theMART in Chicago each year, allows our Interiors team to stay on top of the trends in all vertical markets, including Healthcare. As someone who has spent many years working on Healthcare projects at TLCD Architecture, I was particularly interested in how my observations matched with those of Steelcase, one of the leading manufacturers of furniture for hospitals, offices and classrooms. This last week, representatives from Steelcase Health, and our Steelcase Furniture Account Manager gave a presentation at TLCD Architecture on new solutions for healthcare spaces. As designers and architects for our healthcare clients, they emphasized the need to create spaces that support communication and collaboration between patients, clinicians and family members so that everyone becomes a mutual participant in the patient’s health. Additionally, there is increasing need for productive and comfortable waiting or “transition” spaces for the family members whose day may have unexpectedly been put on hold while taking care of their loved one. As the “center” of the healthcare experience, exam rooms are not only for physical examinations, they are also used for consultations and for family members to receive instructions for at-home care. The typical exam room table is being replaced with residential-like recliners for the patient, and a comfortable lounge chair or sofa for the family member. The clinician is given an ergonomic stool and adjustable height table to remain at the same eye level as the patient and family member. Technology has also evolved and mobile carts for ipads or computer monitors can easily move to help the clinician face the patient and family member. The use of demountable walls (walls that can be relocated), and modular furniture can also support evolving technology and room uses. Waiting or “transition” spaces are changing as well and play a significant role in improving the overall healthcare experience. Rather than row upon row of uncomfortable chairs facing one direction, today’s waiting room offers choices and supports a range of postures and activities. People waiting may need to pull out their laptop and work for a few hours, charge their phone, have a conversation, watch young children or take a rest. It’s our role as Healthcare designers to accommodate these functions and provide furniture solutions that support a wide range of needs. I’m very excited to share and implement the new furniture introductions showcased at Neocon with my clients and the customers they serve. The healthcare landscape is always changing as providers evolve the framework for care and adjust capital plans to maximize shifting reimbursement models, stay current with medical technology and respond to shifting political priorities and societal demands. In recent years, the Affordable Care Act and the cry for improved mental healthcare services have pushed the industry to increase outpatient primary care and mental health capacities. This trend is leading some in the industry to cast away old notions and stigma – and seize the opportunity to make mental health an integral part of primary healthcare. In a recent design competition, TLCD Architecture explored how the fusion of mental health and primary care could be supported in the built environment. 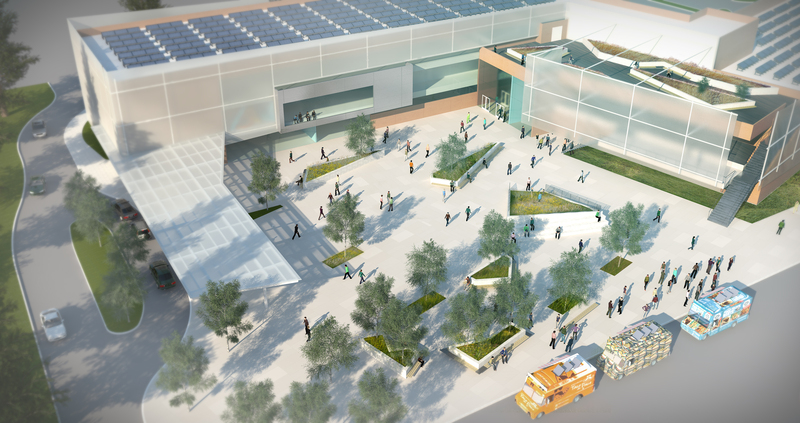 The resulting outpatient campus brings primary care and mental health together in a unified, community-focused design while addressing privacy and security concerns. The concept of total patient wellbeing begins with easy access for patients and incorporates healthy opportunities of exercise, farmers markets, community activities, health education and medical care. Giving people a reason to visit the site on a regular basis for everyday activities serves to promote health and wellbeing. 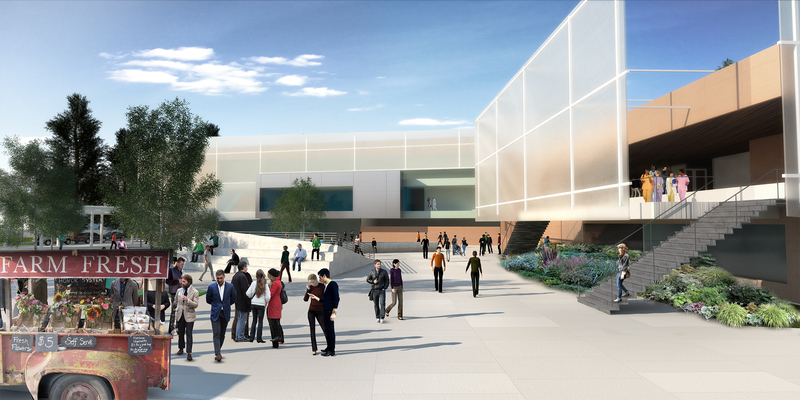 During the design process TLCD Architecture used our own healthcare experience that includes recent work on acute and outpatient mental health facilities, as well as assembling a team of designers, planners and engineers with diverse backgrounds to bring fresh perspectives to the discussion. We also used the growing body of research that brings these ideas into focus and provides motivation for healthcare providers to integrate primary care and mental health services that result in improved patient care, financial efficiencies and increased marketplace appeal. As designers, TLCD Architecture believes that it’s our responsibility to bring design and operational innovations and new thinking to our clients so they are well informed as they make decisions that shape the future of healthcare. For more information visit these resources. A small but important TLCD Architecture project was featured in an article, ‘County Overhauling Mental Health Services for Those in Crisis’ in today’s Press Democrat. The Sonoma County Crisis Stabilization Unit is a new facility that will replace the existing, outdated facility currently housed in the old Sonoma County (recently Sutter) Community Hospital complex on Chanate Road. The Crisis Stabilization Unit will expand and improve the County’s emergency mental health services which treat 4500 clients each year. This new, larger facility located at The Lakes business park in west Santa Rosa will be more accessible to the clients they serve and visible to the community. In addition to providing services to adults, it will also provide much needed services to adolescents who are currently among the most underserved in the North Bay mental health care community. Project Manager Jason Brabo, Project Architect Carl Servais, Project Captain Julie Wycoff and Interior Designer Domenica Sheets are the project team. The 15,000 sf unit is a Tenant Improvement in an existing business park and has been designed to meet the specific needs of the clients and staff. It will serve those who come in on a voluntary basis as well as those who arrive involuntarily or by law enforcement and will provide a calm, clean and welcoming place for them to access treatment. Inside the Aurora Santa Rosa Hospital. 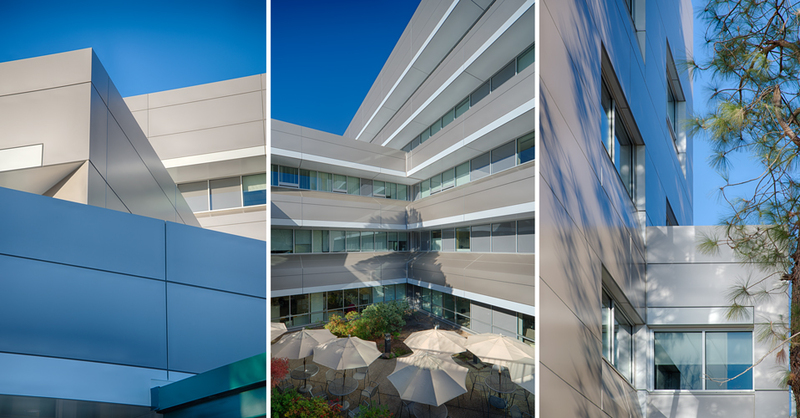 TLCD Architecture recently completed renovations at this mental health hospital in Santa Rosa, CA. The finishes selected create a warm, welcoming atmosphere conducive to healing. The same design approach is being used in the Sonoma County Crisis Stabilization Unit. 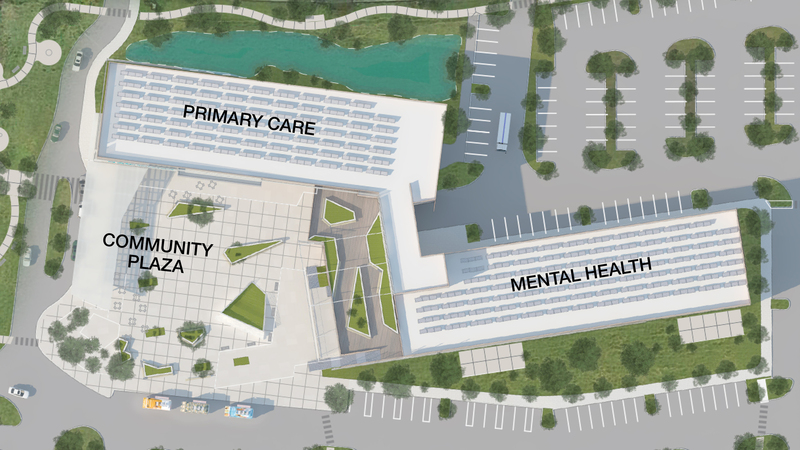 The Crisis Stabilization Unit is the second mental health services project TLCD has worked on – the first being the recently completed 95-bed Aurora Santa Rosa Hospital, mentioned in the article. TLCD’s design team has worked closely with the Crisis Stabilization Unit care providers to create a space that will greatly improve emergency mental health care for Sonoma County residents. The work is interesting, complex and challenging. It is also very satisfying to know that the work we do will help improve care for some of the most vulnerable people in our community. I recently had the pleasure of attending a conference focused on Emergency Department design hosted by The Center for Healthcare Design and held at the AIA San Francisco. TLCD Architecture is a corporate affiliate of the CHC which gives us access to a wide array of seminars, webinars and conferences related to healthcare design. The topics presented at the ED Design Conference delved deeply into the current thinking of how Emergency Departments are designed and organized with an eye to better addressing long wait times, delivery of care, and responding to an ever-changing healthcare environment. The presenters were a mix of healthcare providers and designers specializing in Emergency Department design. Triage based intake practices are outdated and increase wait times and create backlogs. More and more EDs are going to “Split Flow” patient intake and rapid treatment methods whereby patients are seen immediately and are either treated in a low acuity area or are sent to an ED treatment room. Patients never return to the waiting area, but are constantly kept moving through their care. 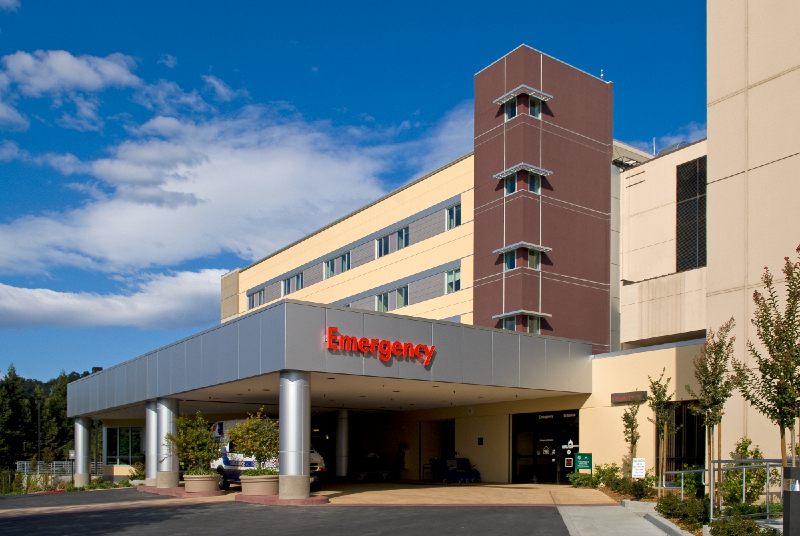 Emergency Departments must be designed so that they can respond to all types of patients and all types of events. Rather than designing highly specific treatment rooms, all rooms should be of a universal design that can accept any patient at any time. The answer to the problem of overcrowding and long wait times isn’t necessarily adding more treatment rooms or space. Often a thorough evaluation of staffing and patient intake patterns can lead to changes that do not require costly changes to the physical environment. The Emergency Department is increasingly the primary healthcare access point for many in this country not only for trauma patients but for those with chronic conditions to the mentally ill. As such, EDs must be able to rapidly adapt to these types of patients in addition to everything from an infectious disease outbreak to a natural disaster. Designers and providers can work together to create spaces that can effectively deliver care, provide an organized work environment for staff, and a safe, healing space for patients. Knowing the needs of Emergency Departments and the challenges they face allows TLCD to help our healthcare clients plan their Emergency Departments for the present and future. 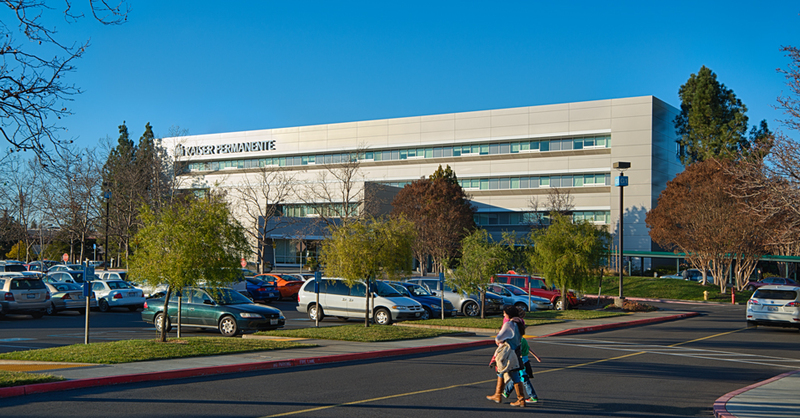 The exterior of the existing Kaiser Santa Rosa Hospital, built in the early 1990s was showing the signs of age and was in need of replacement. TLCD Architecture and Swinerton Builders worked together to replace the exterior building skin with a new composite metal panel system. The project not only provided a solution to a deteriorated exterior, it also reinterpreted the original architecture into a contemporary building. 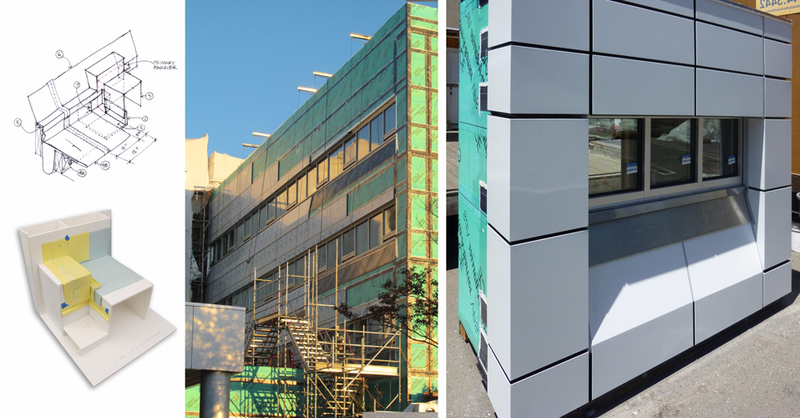 The meticulous installation of the composite metal panels was an important aspect of the design and worked with the complexity of the existing building geometry to modernize the identity of the building and campus. The use of virtual models, physical models and on site mock-ups made the precise installation possible and turned the design intent into reality. The project needed to be constructed in phases to allow the hospital to remain fully operational throughout construction. The design and construction team worked together with the facility to develop construction sequencing and installation strategies that evolved throughout construction to minimize disruptions to the facility and keep them operational. It was an amazing process to be a part of and the successful results speak to the teamwork involved to “Skin the Hospital”! Check out this video put together by Swinerton Builders for more on the project. The Aurora Behavioral Health Psychiatric Hospital in Santa Rosa has reached another milestone in their efforts to bring the facility to full operating capacity. 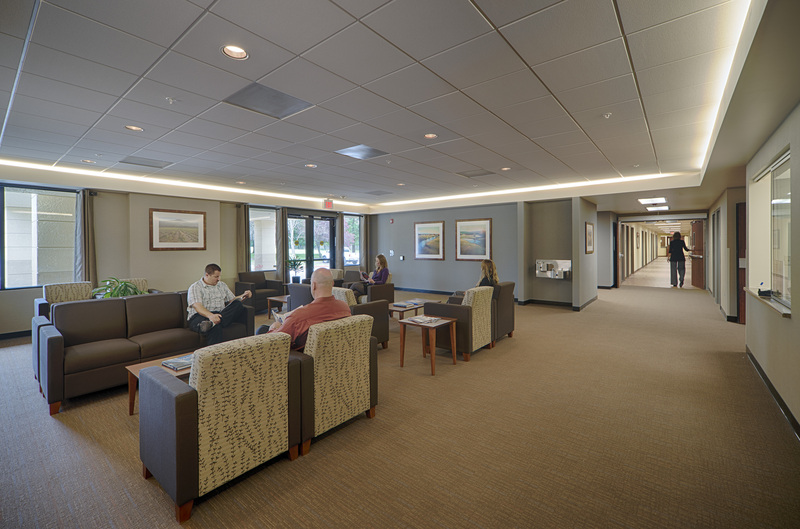 TLCD Architecture enjoyed working with Aurora Behavioral Health for the renovation of the facility and are gratified to have been a small part of their efforts to bring quality mental healthcare back to Sonoma County. Please read the North Bay Business Journal article for the full story.